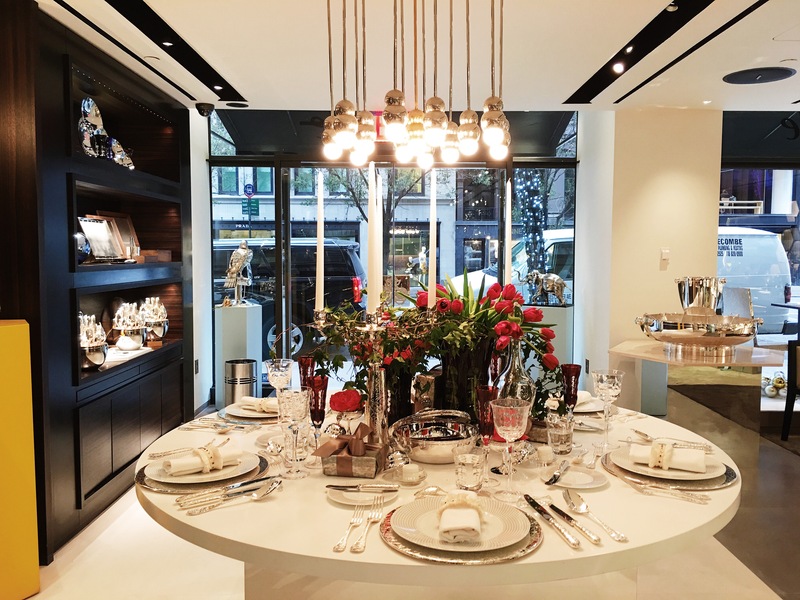 With Hannukah, Thanksgiving, and Christmas just around the corner, French Silver company, Christolfe, asked Guillaume to design a tablescape for an evening of hor d’oeuvres and shopping at their flagship store on Madison Avenue. This would be the first time Guillaume showcased his exceptional talent on Madison, and so of course he was thrilled to lend a hand! Especially because 10% of all of the night’s sales went to The American Cancer Society’s NYC Hope Lodge, an organization he’s incredibly passionate about. 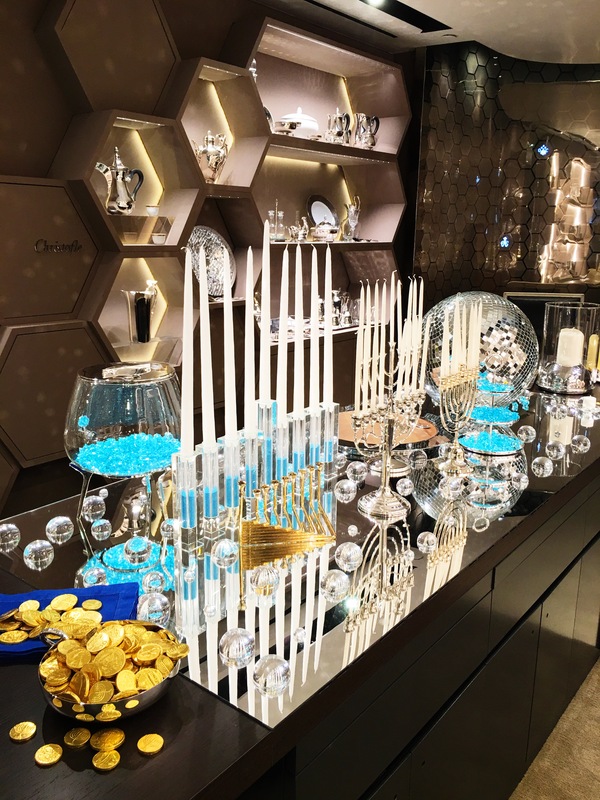 There was, of course, plenty of chocolate gold coins to go around in the spirit of Hannukah, as well as a cheeky play on the traditional holiday blue. (Glitter was even poured into flower vases and turned into candle holders!) It was certainly a very sparkly event! Notice Guillaume is not afraid to mix silver and gold? Don’t be frightened to experiment! Not to be forgotten, of course, was the Thanksgiving and Christmas dining table, finished with striking elements of red and white to match Christolfe’s beautiful crimson champagne flutes. This was especially eye-catching, and on more than one occasion, pedestrians outside paused to take a look at the table top design happening inside. Guillaume loves to repurpose things, too – that little candle holder in the image below was originally a butter dish. Another little trick of Guillaume’s is the playful combination of modern against traditional – you can see that he’s plated two very different Christolfe collections together, and it works! He also repurposed some spare trim from Robert Allen, turning them into cute little Napkin Rings. It’s all about working with what you’ve already got. The night was an overwhelming success, with guests taking home some new knowledge on how to set the perfect tabletop for their holiday party. We think Guillaume certainly proved that you can have fun at the dinner table– what about you? Let us know how you plan to design the table for your next dinner party in the comments!